Offering its guests a multitude of activities and amenities, all under the famed Hilton banner, Pointe Hilton Tapatio Cliffs Resort is an extraordinary escape from the ordinary. Featuring more than 500 two-suite rooms -- including a separate living room with an executive work desk -- Pointe Hilton Tapatio Cliffs Resort goes above and beyond the average golf resort experience in giving its guests a delightful trip into the world of pure luxury. Add to that shimmering swimming pools, excellent dining options and a central location near the bustling city of Phoenix, and it's easy to see why this golf resort stands above the crowd. For golfers, the renowned Lookout Mountain Golf Club will challenge players of all skill levels, while dazzling all with spectacular desert vistas. This beautiful resort course takes players through the rugged terrain that borders the Phoenix Mountain Preserve and offers spectacular views of both Lookout Mountain and Piestewa Peak. Golfers will quickly recognize why Lookout Mountain G.C. has received recognition over and over again as one of Americas Top Courses by participants in the Zagat Survey as well as receiving top honors from Golf Magazine. Whether it's golf, luxury (or both) you're after, Pointe Hilton Tapatio Cliffs Resort will truly be an escape worth making for travelers. Stay 3 nights at select hotels in Scottsdale and get a 4th night free. 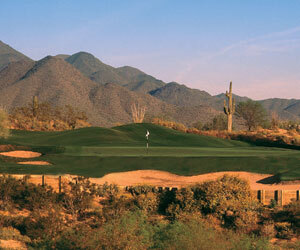 Play unlimited golf at some of Scottsdale’s finest courses. View available packages below and customize your free quote today by clicking below.